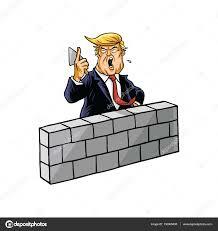 In a telephone conversation, the presidents would have discussed the subject of the wall on the border of the two countries. According to an official, Trump "lost his temper"
Plans for Mexican President Enrique Peña Nieto to make his first visit to the White House to meet with his United States counterpart, Donald Trump, suffered another setback this week after a discussion of the border wall during a dialogue between both by telephone, the Washington Post reported on Saturday . The newspaper, which cites American and Mexican officials informed of the discussion, asserts that Peña Nieto planned an official trip to Washington this month or early March, but both countries agreed to suspend the plan after Trump declined to state publicly that Mexico did not will finance the border wall. The 50-minute conversation took place on February 20, and was largely devoted to discussing the subject of the wall, although no agreement was reached. According to a Mexican official, during the conversation Trump "lost his temper". The paper also indicates that US officials described the US president as frustrated and exasperated by asserting that Trump does not consider it reasonable for Peña Nieto to expect him to abandon his campaign promise of forcing Mexico to pay for the construction of the border barrier. Peña Nieto had already canceled his visit to the White House, expected shortly after Trump's inauguration, when the conflict between the two countries over the construction of the wall exploded. Although the two governments have continued their dialogue and have softened their tone, Trump continues to demand that Mexico pay for the wall, while the Mexican president insists he will never do so.